You walk into your doctor’s office complaining you’re feeling a bit blue. And you walk back out clutching the cutest prescription EVER. But to fill it you DON’T head to the pharmacy. You head to the nearest pound instead. Because your “prescription” is actually instructions to adopt a furry friend. Or maybe it was chronic pain, mounting stress, or even finding yourself huffing and puffing and out of shape that sent you to see the doc. But no matter the cause of your visit, the prescription is still the same… pet ownership. Sound strange? It could be the future. Because a growing stack of research is pointing to pets as a way to dramatically improve our physical and mental health. And now a new national poll is adding to the evidence. Bringing a good boy or girl home could be JUST the medicine you need no matter WHAT ails you. 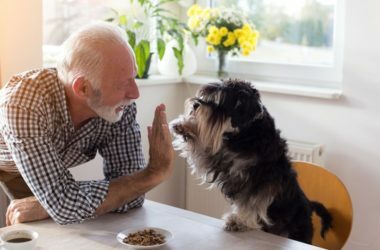 According to the new poll by the University of Michigan, owning a pet can help older folks cope with physical and mental challenges. Over half, 55 percent, of adults 50 to 80 have a pet, according to the survey. And more than fifty percent of those folks have multiple furry family members. Are you starting to see why letting a furry friend into your life and heart can be SO good for your health? But the benefits don’t end there. For folks who rated their health as fair or even poor, the health benefits were even more dramatic. Incredibly 70 percent of this group said their pets help them cope with their physical AND emotional symptoms. And almost HALF of the folks who were in pain… 46 percent… reported that their pets help them overcome their pain. And the reasons why, are obvious. They start with your furry companion being a source of unconditional love and pleasant distraction. You’re far less likely to focus on your pain or other symptoms when you’re hysterically laughing at your dog’s latest antics. And then pets of all sorts cause you to be more physically active. Whether you’re playing laser pointer with your cat, teaching your parrot a new trick, or walking your dog, you end up moving MORE. The poll did find one potential downside to pet ownership, and that is they can sometimes be costly. Food, pet sitting, and vet visits all have to be considered when you’re figuring out your budget. But the MANY health benefits can balance out some of those costs. Earlier research has found pet ownership can be good for your heart health, for example. In fact, one study showed that pet owners are 30 percent less likely to have a heart attack and 40 percent less likely to have a stroke. And a Korean study found having a pet to care for significantly eases depression. While other studies have shown sharing your life with an animal reduces stress and pain. Adopting a pet can make you happier and healthier. And there are even programs that can help offset some of the costs of pet ownership. Look online or check with your local SPCA or The Humane Society for tips on getting lower cost prescriptions, vaccinations, and even food for your furry or feathered friend. Pets INSTEAD of prescriptions? Sign me up!